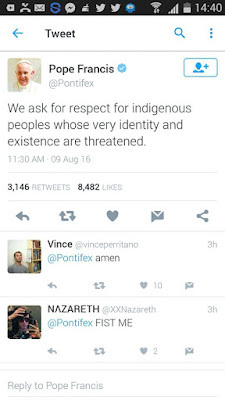 "WE ASK FOR RESPECT FOR INDIGENOUS PEOPLE WHOSE VERY IDENTITY AND EXISTENCE ARE THREATENED"--POPE FRANCIS. WE ASK FOR RESPECT FOR INDIGENOUS PEOPLE WHOSE VERY IDENTITY AND EXISTENCE ARE THREATENED-POPE FRANCIS. The indigenous people of Biafra (IPOB) who are asking for freedom and their rights to Self-determination from Nigeria have seen over 4000 unarmed Biafan protesters killed in Nigeria, in less than (2) two years into Buhari's administration. The president of Nigeria, Muhammadu Buhari have killed over 4000(four thousand) Biafrans and even abducted the leader of the indigenous people of Biafra, Nnamdi Kanu, since October 14, 2015 and till now he's still ill in jail and while the Nigeria Armed Forces Carryout their mass genocide on Biafrans. Biafrans have been calling on world leaders, even writing letters to countries like France, Russia, Germany, United States of America and also Britain to come to their aid. Biafrans have also written to United Nations, Human Rights and Amnesty International. Up until now, Biafrans have gotten no replies. Amnesty International visited Nigeria when they came to investigate the massacre of Biafrans by the Nigeria Armed Forces. After their investigations they concluded that the Nigeria Army were guilty of violating Human Rights law and asked the Nigeria government to bring those involved to book but all have been in vain, because nothing has been done, while the killings of Biafrans still continues. Now after much appeal from Biafrans all over the world, who were tweeting, writing and calling to him, asking for help to stop the killings of Biafrans in Nigeria, Pope Francis finally responded on his twitter account, while calling on his fellow world leaders, also the United Nations and Human Rights to come to the attention of Biafrans who are been killed in their quest for freedom in Nigeria. He further advised that the Nigeria government stop this mass genocide on Biafrans and grant them their rights to self-determination. 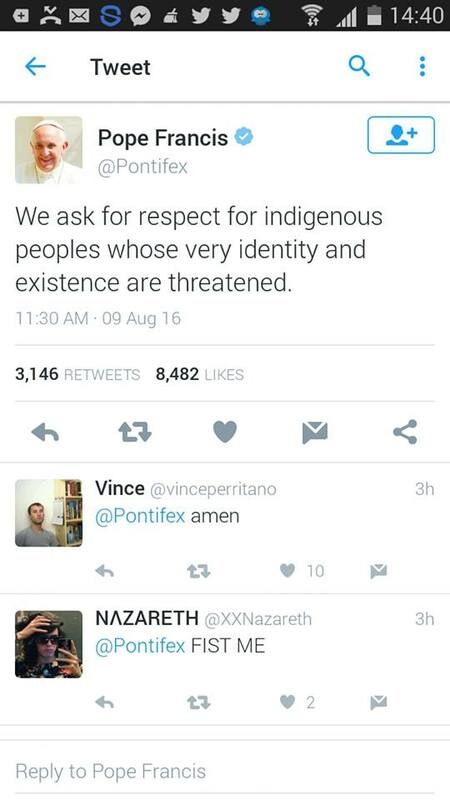 Pope Francis twitted..“We ask for respect for indigenous people whose very identity and existence are threatened”-Pope Francis. The truth and the rightful proclamation for justice by the Pope. Other world leaders should follow suit. 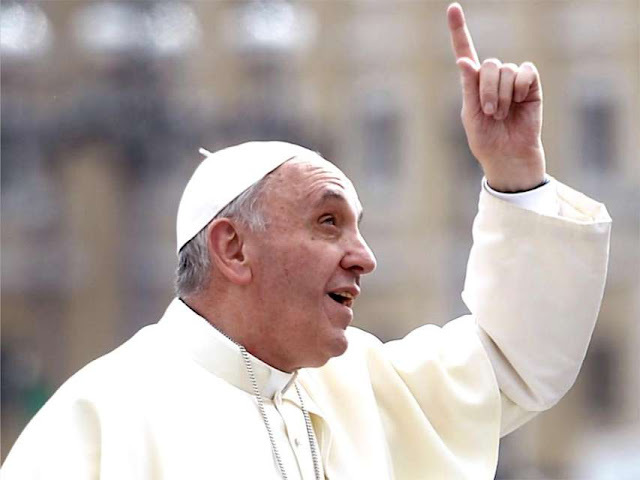 The truth and rightful proclamation for justice by the Pope Francis. Other world leaders should do the same. God is watching all of you in your deeds!